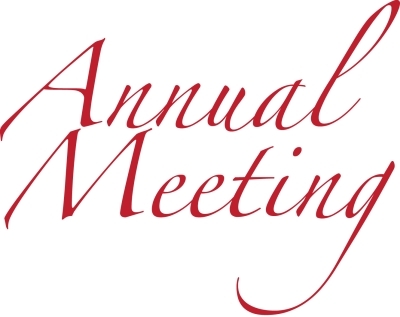 The 2019 MSRL Annual meeting will be held Monday, April 1st (no fooling) through Friday, April 5th. Monday will be a core workshop displaying cores from a number of different basins and ages. Tuesday and Wednesday will be the main meeting with talks and posters. Thursday will be a short course – Characterization of Mudrock Reservoirs. MSRL researcher Dr. Toti Larson, along with graduate student co-authors Benjamin P. Smith and Nick Ettinger (now with Equinor), has won the prestigious Jules Braunstein Memorial Award for the best poster presented at the 2018 American Association of Petroleum Geologists (AAPG) Annual Convention and Exhibition. Larson's poster, titled From Carbonate Factory Collapse to Recovery: Insights Through Box Modeling of Carbon Isotope Excursions of Oceanic Anoxic Events (OAE’s), reflects one his current research interests, OAE’s. A PDF version of this poster is available to MSRL members via the “Additional Posters and Presentations" page on the members’ web site. 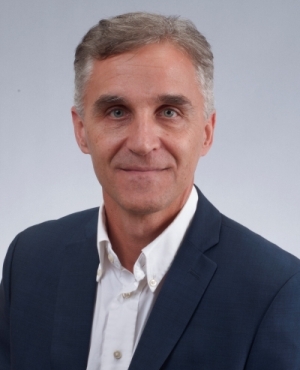 Larson will be presented with the award at the opening ceremony of the 2019 AAPG ACE in San Antonio. ACE 2019 will also feature numerous presentations by MSRL researchers looking to follow Larson’s example. Outline: This short course will describe the advances the MSRL team has made in analyzing, interpreting, and modeling unconventional mudrock reservoir systems. This is an advanced course that expands on the research findings that we have presented at annual Spring MSRL meetings and short courses. In this course the emphasis will be on integration of our research on chemostratigraphy, hydrocarbon geochemistry, and pore system characterization with facies and flow modeling as related to oil and gas production. To reserve a space contact Dr. Steve Ruppel (stephen.ruppel@beg.utexas.edu) no later than November 21st, 2018. On Wednesday, July 26th and Thursday, July 27th, the MSRL research team hosted a visit from new industrial associate, Sinopec. 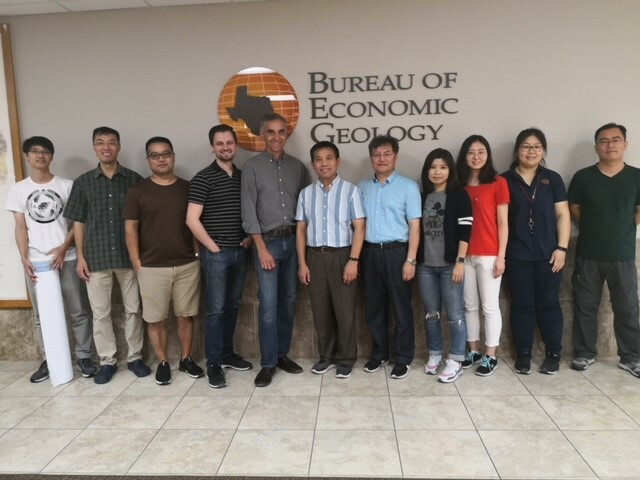 A group of six Sinopec researchers lead by Prof. Maowen Li, Chief Geologist, and Dr. Geer Teng, Vice President, visited the Bureau of Economic Geology. MSRL researchers lead by co-PI Dr. Farzam Javadpour presented a brief introduction to MSRL research on Wednesday afternoon. On Thursday morning, MSRL researchers lead by Dr. Robert G. Loucks discussed mudrock cores from the Eagle Ford, Bakken, and Wolfcamp Formations with the visitors. 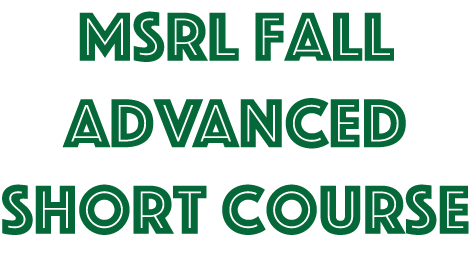 Save the Date: Tentative plans are for the next MSRL Annual Meeting to be the first week of April in 2019. Input is encouraged from member companies on potential conflicts during this time. Current plans are for the meeting to include two days of presentations, a one-day core workshop, and an introduction to mudrocks short course. A number of MSRL researchers attended the recent American Association of Petroleum Geologists Annual Convention and Exhibition, which was held May 20th to 23rd in Salt Lake City, Utah. Presentations and posters from that event have been added to the “Additional Posters and Presentations” page on the MSRL members’ web site. To discuss any of these please contact the researchers involved. 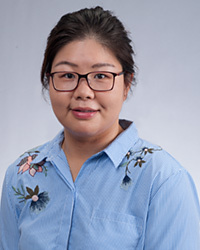 A new paper from MSRL post-doc Lucy Tingwei Ko and others. Pore-types and pore-network evolution in Upper Devonian-Lower Mississippian Woodford and Mississippian Barnett mudstones: Insights from laboratory thermal maturation and organic petrology. International Journal of Coal Geology, 2018, v. 190, p. 3-28. Pore-evolution models from immature organic-matter (OM) -rich Barnett (0.42%Ro) and Woodford (0.49%Ro) mudstones were compared with models previously developed from low-maturity OM-lean Boquillas (Eagle Ford equivalent) mudstones to investigate whether (1) different mineralogy (siliceous vs. calcareous) exerts different catalytic and sorption effects and influences OM-pore origin and evolution; and (2) different types of macerals show different OM pore evolution history. 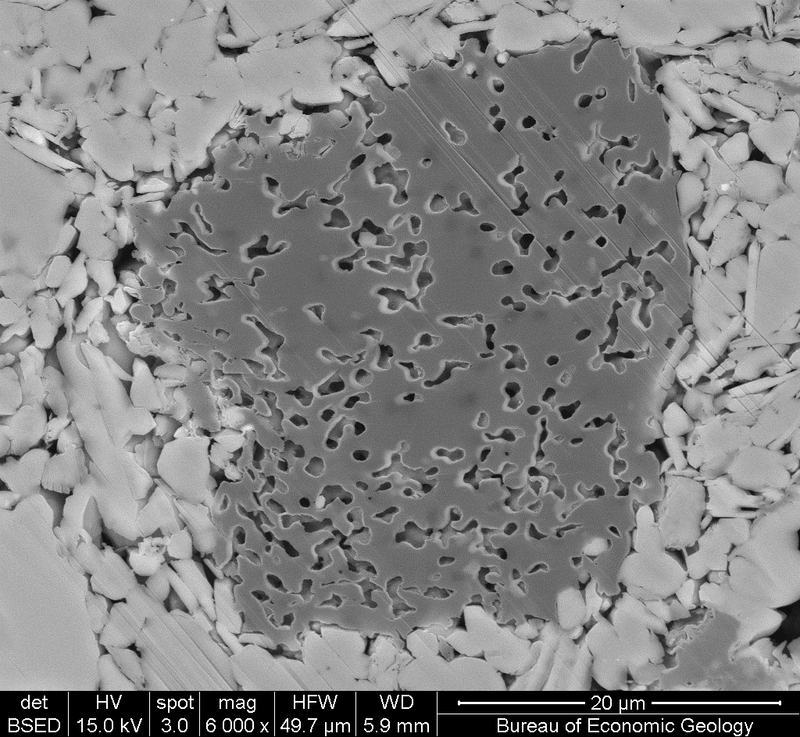 Laboratory gold-tube pyrolysis, scanning electron microscopy (SEM) and thin-section petrography, organic petrography, and geochemical characterization were used to investigate the role of bulk mineralogy, maceral type, and thermal maturation on OM-pore evolution. Results suggest that mineralogy has little impact on OM-pore development and evolution. Macerals, identified using both SEM (platy OM, particulate OM, organic–mineral admixtures, Tasmanites) and organic petrology (vitrinite, inertinite, amorphous organic matter [AOM]/bituminite, telalginite [Leiosphaeridia, Tasmanites]), do affect the origin and evolution of OM pores owing to differences in chemical compositions, generation kinetics, and activation-energy distributions between Tasmanites, matrix bituminite, and other types of macerals. Leiosphaeridia and Tasmanites in Woodford mudstone samples exhibit a delay in onset and a shorter period of petroleum generation and pore development compared to the matrix bituminite in the Barnett and Woodford mudstone samples. Pre-oil solidbitumen was observed to have migrated into initial primary mineral pore networks at the bitumen generation stage in both Barnett and Woodford samples. At higher levels of thermal maturation, the volume of primary mineral pores decreases and the pore volume composed of modified mineral pores and OM pores becomes greater. Pore evolution and pore-type heterogeneity in these mudstones is a function of the initial mineral pore network, types of kerogen and macerals, and generation kinetics of individual macerals upon thermal maturation. The Mudrock Systems Research Laboratory Annual Meeting was held recently (March 19-22). Oral presentations (more than 20) and poster displays (16) are now available for download on the member’s web site. A streaming video archive of talks is also available for viewing. The meeting also featured a core workshop with six mudrock cores plus a short course: Introduction to Mudrock Systems – Origin, Distribution, Fluid Flow and Reservoir Characterization. For information on attending next year’s meeting, contact Steve Ruppel or Farzam Javadpour. Tentative Agenda for MSRL Annual Meeting, 2018. Monday the 19th will feature the core workshop. Tuesday the 20th and Wednesday the 21st will be the oral and poster presentations. Please note that the meeting site will be slightly different this year, the talks on Tuesday and Wednesday will be held in the Research Office Complex Auditorium, just south of the main Bureau building. Bureau Directions and Maps. The carbon cycle fundamentally controls how fossil fuels are stored and distributed in the Earth and is an important feedback system between the atmosphere, ocean and crustal rocks. Ultimately, the change of carbon fluxes (i.e., weathering, organic and carbonate burial, and upwelling) through time may have the most significant control on the spatial distribution of hydrocarbon deposits. From the view point of a geochemist: changes in carbon chemistry measured in drill cores offer important insights to the Earth’s carbon cycle through time, and are necessary to understand the complexities of unconventional resources. I am currently developing new geochemical tools within the MSRL to collect high spatial resolution geochemical data from drill cores collected across mudrock and carbonate depositional systems. To the existing geochemistry facilities, I am adding sulfur isotope ratios, dolomite and natural gas isotope analysis. These data are used to define lateral changes in chemical facies across sedimentary basins, quantify depositional redox conditions along stratigraphic columns, develop global-scale oceanic chemistry models through time that can be used to correlate rock records across different basins, and help understand dolomite formation history. My current research focuses on oceanic anoxic events (OAE’s) that are recorded throughout the Cretaceous Period. OAE’s reflect times when major changes in the Earth’s oceanic chemistry occurred and are typically recorded by the deposition of unconventional hydrocarbon deposits including the Eagle Ford and Niobrara Formation. To understand the onset of, and eventual recovery from OAE’s I am integrating high resolution X-ray fluorescence (XRF) major and trace data, and carbon isotope data for organic and inorganic fractions with numerical box model simulations. This approach is used to investigate how changes in oceanic carbon fluxes such as weathering input, oceanic circulation, and organic carbon deposition are recorded in the rock record locally, regionally, and globally. For example, within the Eagle Ford Formation we are using the relative timing between carbonate and organic carbon isotope excursions and shifts in trace element concentrations to understand the linkage between the collapse of the stable carbonate factory of the Comanche Platform, the deposition of the organic-rich Eagle Ford Formation, to the eventual recovery and deposition of the Austin Chalk. In order to better realize our mission of providing top flight research to member companies, the Mudrock Systems Research Laboratory is seeking a Shale Sedimentologist/Stratigrapher to add to our group. So if you, or someone you know, wants to be part of the MSRL team, this is the time. Duties include conducting basic and applied research in the characterization and interpretation of mudrock depositional systems. Also overseeing and coordinating data collection activities using microscopy, x-ray diffraction, and x-ray fluorescence analysis of facies. The successful candidate will interact with graduate students and present research findings at professional meetings and in print. New Publication: Reed, Robert M. (2017) Organic-matter pores: new findings from lower-thermal-maturity mudrocks. GCAGS Journal, v. 6, p. 99–110. Available on the MSRL Members’ web page or at the Gulf Coast Association of Geological Societies web site. Based on research presented at the 2016 MSRL meeting, this publication details findings on organic-matter pores in mudrocks with an Ro less than 0.7% from three locations in Texas. The article provides additional information on organic-matter pores that follows up on previous groundbreaking MSRL research on this subject (e.g. Loucks et al., 2009, 2012). MSRL researchers will continue efforts to understand the nature and distribution of this important type of mudrock pore. New pore analyses of low-thermal-maturity (Ro < 0.7%) organic matter of possible or probable terrestrial origin (Type III kerogen) from three mudrock units in Texas contradict previous pore work on low-thermal-maturity, mostly marine organic matter from the Barnett and Eagle Ford Shales. In early work on mudrocks containing primarily marine organic matter, organic matter at Ro < 0.75% was observed to typically lack pores, whereas some thermally mature organic matter did develop pores. However, this pattern of pore development was not observed by all researchers working on other units, some of whom did see pores in organic matter at lower thermal maturities. To understand if predepositional pores in terrestrial organic matter are responsible for the discrepancy in pattern, this study focuses on organic matter at low thermal maturities, which should not have thermally generated pores. Two beds of organic-matter-rich mudrock from a terrestrial depositional environment were sampled from the Paleogene Wilcox Group of East Texas. The mudrocks have an Ro of < 0.5%, a siliceous–argillaceous composition, and > 11% total organic carbon (TOC). Based on Rock-Eval pyrolysis results and depositional setting, the kerogen is thought to be dominantly Type III. Some silt-sized organic-matter grains in these samples contain probable predepositional pores. Pore sizes are up to 5 µm in length, and up to 27% of the organic matter has pores. Pores are more common in the larger organic-matter grains. Samples from one core interval of the basal Cretaceous Eagle Ford Group on the San Marcos Arch of South Texas have abundant vitrinite (Ro ~ 0.45%) based on visual analysis, in contrast with shallower layers, which are vitrinite-poor. Rock-Eval pyrolysis results suggest the presence of Type III kerogen. Although these basal mudrock samples are more argillaceous than the rest of the Eagle Ford, they were deposited in a marine environment. Some of the organic matter in these samples has predepositional pores. Some of these pores are elongate, with sizes > 1 µm. Pennsylvanian Smithwick Shale samples from the Fort Worth Basin of Texas have thermal maturity ranging from 0.4 to 0.71% Ro. Although much of the unit is marine, observed plant fossils suggest a mixed-organic-matter source. Some Rock-Eval pyrolysis results also suggest Type III kerogen. Much of the organic-matter shows a newly identified organic-matter pore texture. Instead of consisting of a mass of organic matter with spherical holes, the organic-matter is a composite grain made up of smaller, spherical organic-matter bodies. These organic-matter bodies vary slightly in size, but most are 60 to 100 nm in diameter. Pore space is present between the organic-matter bodies. Several possible formation mechanisms exist for these organic-matter bodies, but they strongly resemble “nannobacteria” described by previous researchers. RI0281. Lithofacies of the Wolfcamp and Lower Leonard Intervals, Southern Midland Basin, Texas, by R. W. Baumgardner, Jr., H. S. Hamlin, and H. D. Rowe. 67 p., 41 figs., 5 tables, 1 appendix, 2016. RI0281, $15.00. ISBN 978-1-970007-06-0: Print. To purchase this publication as a (PDF) download, please order RI0281D ($15.00). This report, conceived as a follow-up to regional treatment of the Wolfberry depositional systems in Report of Investigations No. 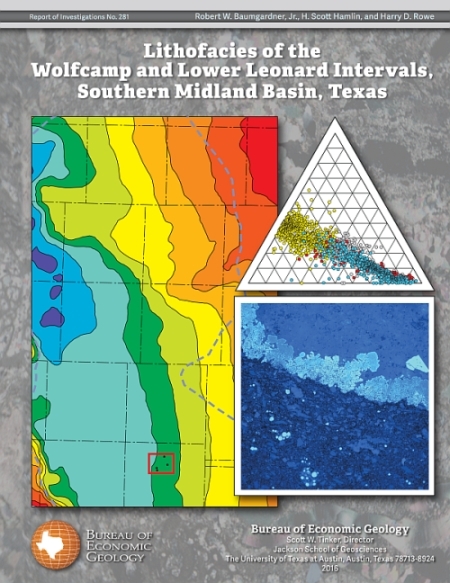 277, focuses on basinal facies of the lower Leonard and Wolfcamp intervals in the southern Midland Basin. The report provides detailed lithologic information about mudrocks and associated facies that were largely ignored before they became prolific producers of hydrocarbons as a result of hydraulic fracturing and horizontal drilling. Readers interested in the regional view presented in RI 277, and those seeking detailed lithologic information about the so-called Wolfcamp A and B zones, should find value in the core-based descriptions of lithofacies in this report, which examines the most continuous basinal cores publicly available from the Lower Permian/Upper Pennsylvanian interval in the Midland Basin. Detailed core description (including thin-section analysis)—combined with total organic carbon (TOC) sampling, handheld XRF scanning, and micro-rebound hammer testing at 1-ft spacing (techniques applied to these cores for the first time)—reveals significant, facies-related differences in TOC content, mineralogy, and rock strength. In addition, programmed pyrolysis (Rock-Eval®) analysis reveals that most kerogen in the lower Leonard/Wolfcamp interval is in the oil-production window and has matured to Type II–III (“oil-gas prone”). Stratigraphers as well as explorationists will find information here to improve their understanding of Permian-age basinal mudrocks in the Midland Basin. Basinal mudrocks and associated facies assigned to the Wolfcamp and lower Leonard lithostratigraphic units in the Midland Basin are prolific producers of oil and gas. Four facies are recognized in core on the basis of macroscopic examination, XRD analysis, and ED-XRF elemental chemistry: (1) siliceous mudrock, (2) calcareous mudrock, (3) muddy bioclast–lithoclast floatstone, and (4) skeletal wackestone/packstone. Mudrocks are largely hemipelagic deposits of fine-grained sediment delivered by suspension settling. Floatstones were deposited by debris flows that originated on carbonate shelves around the basin. Wackestones/packstones are finer grained sediment density-flow deposits, probably turbidites, reworked by local bottom currents. These sediments were deposited below storm wave base in a basin having limited connection to the open ocean. During deposition, low-oxygen conditions prevailed in bottom waters and sediments, as shown by the presence of agglutinated foraminifera, rarity of burrows, widespread prevalence of small (<6 μm) pyrite framboids, presence of phosphatic nodules, and elevated molybdenum concentrations. Total organic carbon (TOC) content reaches 6.8 percent. TOC is facies-dependent (highest in siliceous mudrock) and varies widely within small vertical distances. Cyclicity is evident in individual meter-thick, upward-fining cycles of floatstone or wackestone/packstone overlain by calcareous and siliceous mudrock. Rock strength increases as calcite content increases, likely as a result of diagenetic cementation. Most kerogen in the lower Leonard–Wolfcamp interval is in the oil-production window and has matured to Type II–III (“oil–gas prone”). On the basis of their TOC and hydrogen content, siliceous mudrocks have the highest potential for hydrocarbon generation.